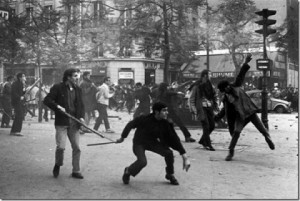 In addition to troubling economic and environmental problems for which no easy solutions were available, West Germany and its politicians had to contend with two new sources of social unrest: the student movement of the late 1960s and early 1970s, and left-wing terrorism, which originated in the late 1960s, but which had its greatest impact in the 1970s. 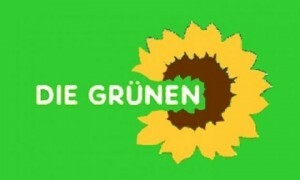 Inspired by the student movement in the United States and by the international movement opposing the war in Vietnam, as well as by rising opposition to the traditional administration of German universities, students organized protest movements at a number of German universities in the late 1960s. 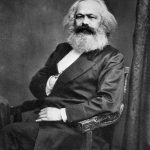 Sit-ins, disruption of lectures, and attacks against buildings housing major publishing companies, such as the Axel Springer Group, were staged by a minority of student groups, primarily those with Marxist ties. Protesters claimed that an “extra-parliamentary opposition” was needed to ensure representation of the people in a state that was governed largely by two major parties. The student protest movement had little support among the population, however, and was finally absorbed by the established parties. Terrorism was also a concern during this period. A few radical student elements sought to realize their aims through political terrorism. Small groups launched violent attacks against “symbols of capitalism.” They fire-bombed department stores in several cities, broke into police stations, robbed banks, and attacked United States military installations. 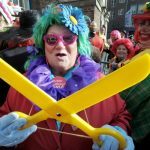 One terrorist group, notorious for its brutality, became known as the Baader-Meinhof Gang, named after its leaders, Andreas Baader and Ulrike Meinhof. Calling themselves the Red Army Faction (Rote Armee Fraktion–RAF), their aim was to assassinate the “levers of the imperialist power structure,” thereby provoking the state to abandon lawful methods of fighting terrorism. The arrest and imprisonment in 1972 of the main RAF leaders led to an intensification of terrorist acts by the group, which culminated in 1977 in the kidnapping of Hanns-Martin Schleyer, the president of the Federation of German Employers’ Associations (Bundesvereinigung der Deutschen Arbeitgeberverbaende–BDA) and in the hijacking six weeks later of a Lufthansa passenger airplane to Mogadishu, Somalia. The aim of both these terrorist actions was the release of Baader and the other RAF prisoners. In a spectacular rescue action, the Lufthansa airplane was stormed by a special unit of the West German Federal Border Force, ending a five-day odyssey through the Middle East. 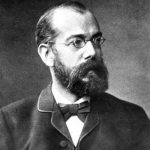 Failing in their coup, Baader and three other RAF leaders committed suicide in their prison cells, and Schleyer was subsequently murdered by his kidnappers. The police had been successful in discovering hideouts, strategy papers, and caches of weapons, however, which led to the severe weakening of the organization of the RAF. Nevertheless, supported by various international terrorist groups, including the GDR’s Stasi, the RAF maintained a small network committed to assassinating prominent public figures. In 1989 they were responsible for the murder of Alfred Herrhausen, a top executive of the Deutsche Bank in Frankfurt, and in 1991 for the murder of Detlev Karsten Rohwedder, president of the Treuhandanstalt, the agency that managed the privatization of property in the former GDR. Following Brandt’s resignation in May 1974, the SPD-FDP coalition partners unanimously agreed that Minister of Finance Helmut Schmidt should head the new government. 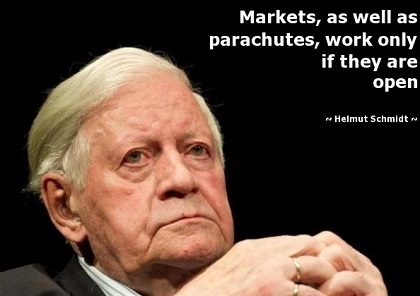 At fifty-five, Helmut Schmidt became the youngest chancellor of the FRG. Born in Hamburg in 1918, he served as an officer in World War II. After the war, he joined the SPD and served in Hamburg’s municipal government, where he acquired a national reputation as a top-notch manager because of his competence in dealing with a severe flood in 1962. He was the SPD faction leader in the Bundestag and minister of defense in the first SPD-FDP cabinet. Schmidt gradually became recognized at home and abroad as a pragmatic politician and an expert in economic and defense matters. His first cabinet included the FDP’s Hans-Dietrich Genscher as minister of foreign affairs. Genscher replaced Walter Scheel, who had been elected federal president in 1974. West Germany’s relations with the East European states had virtually stagnated since the establishment of the Hallstein Doctrine in the mid-1950s. In 1970, in an attempt to lessen tensions in Europe, Brandt and his FDP minister for foreign affairs, Walter Scheel, agreed to negotiate with the communist bloc. For the first time since 1948, the top politicians of the FRG and the GDR held talks, with Brandt and the East German prime minister, Willi Stoph, meeting in Erfurt in East Germany and Kassel in West Germany. Although the talks produced no concrete results because Brandt refused to recognize the GDR as a sovereign state, communication lines were reopened. In December 1970, after ten months of complicated negotiations, the FRG and Poland signed the Treaty of Warsaw. The treaty contained essentially the same points as the Treaty of Moscow on the question of Poland’s western border, the renunciation of territorial claims by the FRG, and the ongoing responsibilities of the Four Powers. In return, Poland agreed to allow ethnic Germans still in Poland to emigrate to the FRG. 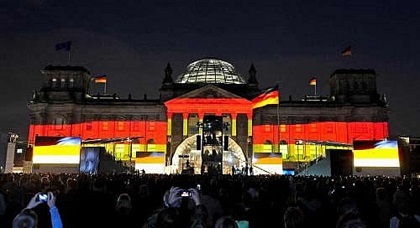 During the subsequent debates on the ratification of the two treaties, the CDU/CSU and part of the FDP made their consent contingent on the formulation of a strong statement by the Bundestag underscoring Germany’s right to reunification in self-determination and of the Allies’ responsibilities for Germany and Berlin. 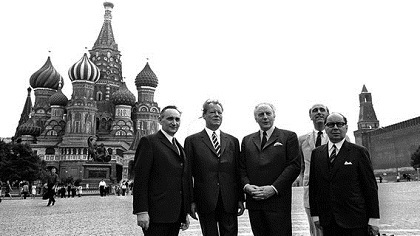 Concurrent with the negotiations on the treaties of Moscow and Warsaw, the Four Powers undertook to end disagreement about the status of Berlin in talks that ultimately led to the Four Power Agreement (also known as the Quadripartite Agreement) of September 1971. The talks, which began in March 1970, got off to a difficult start because the Western Allies and the Soviet Union were deeply divided over their basic interpretation of the “status of Berlin.” After they “agreed to disagree” on this point, progress was finally made, and all sides concurred that the status quo of Berlin should not be changed unilaterally. 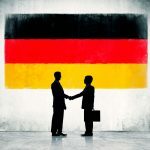 Following the negotiations on traffic between the FRG and the GDR, both sides recognized the feasibility of arriving at a more comprehensive treaty between the two German states. Talks began in August 1972 and culminated in December 1972 with the signing of the Basic Treaty. In the treaty, both states committed themselves to developing normal relations on the basis of equality, guaranteeing their mutual territorial integrity as well as the border between them, and recognizing each other’s independence and sovereignty. They also agreed to the exchange of “permanent missions” in Bonn and East Berlin to further relations. After the bitterly contested approval of the Basic Treaty by the SPD-FDP-controlled Bundestag in May 1973, a political decision that the CDU/CSU had warned against for decades became a reality: West Germany’s de facto recognition of East Germany as a separate state. To many conservatives, the Basic Treaty represented the failure of the Hallstein Doctrine and a final blow to the possibility of Germany’s reunification. 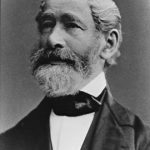 Bavaria filed a suit in the Federal Constitutional Court in Karlsruhe to prevent the treaty’s implementation, but the court held the treaty to be compatible with the provisions of the Basic Law. As a result of the treaty, the FRG and the GDR became members of the UN in June 1973. Willy Brandt became the first democratically elected Social Democrat to hold the chancellorship. Born in Luebeck in 1913, Brandt first joined the SPD in 1930 and later joined a smaller leftist grouping, the Socialist Workers Party (Sozialistiche Arbeiterpartei–SAP). 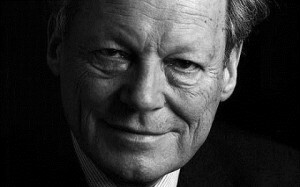 After Hitler came to power, Willy Brandt emigrated to Norway, where he became a citizen and worked as a journalist. After Germany occupied Norway in 1940, he fled to Sweden. Willy Brandt returned to Germany after the war as a news correspondent and later as a Norwegian diplomat in Berlin. After he had again assumed German citizenship, Willy Brandt rejoined the SPD in 1947. He became mayor of Berlin in 1957 and was the SPD candidate for the chancellorship in 1961. In the late 1950s, Brandt was a principal architect of the SPD’s rejection of its Marxist past and adoption of the Bad Godesburg Program, in which the party accepted the free-market principle. The triumph of the CDU/CSU in the 1957 national elections and widespread and increasing prosperity made such a step necessary if the SPD were to win the electorate’s favor. In 1964 Brandt became the chairman of the SPD. From 1966 to 1969, he served as minister for foreign affairs and vice chancellor in the Grand Coalition. When Brandt became chancellor in 1969, he proposed a new policy toward the communist states of Eastern Europe; this policy later became known as Ostpolitik (policy toward the East). In recognition of his efforts toward détente in Europe, he received the Nobel Prize for Peace in 1971. In the early 1970s, Brandt also engineered a package of treaties that normalized the FRG’s relations with the Soviet Union and with Poland, the GDR, and other Soviet-bloc nations. 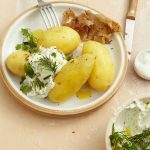 He successfully withstood a vote of no-confidence in the Bundestag in April 1972 and won the Bundestag elections in November 1972 with an impressive relative majority of nearly 45 percent. 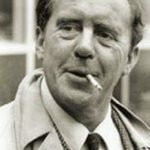 Brandt resigned in May 1974, shocked by the discovery that one of his personal assistants, Guenter Guillaume, was a spy for the GDR. In domestic policy, Willy Brandt and his FDP coalition partners initiated legal reforms, including the passage of more liberal laws regarding divorce and abortion, the latter reform generating intense public discussion. Education reforms calling for new types of schools and for overhauling administration of the universities were only partially carried out. Brandt and his coalition partners were more successful in realizing their foreign policy goals than in achieving their domestic aims. Ulbricht’s state visit to Egypt in 1965 ended the GDR’s political isolation. 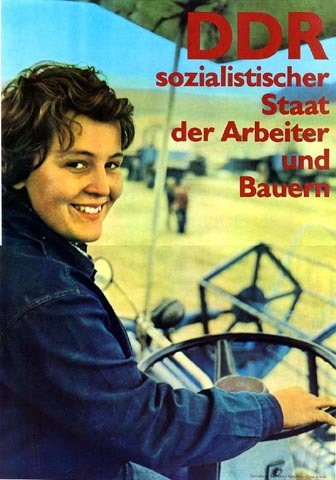 A previously unknown pride in East German achievements and a feeling of distinct GDR identity began to develop, first among ruling party functionaries and then gradually among segments of the population. In 1967 the GDR leadership, encouraged by these developments, attempted to gain official recognition of its autonomy from the FRG. When the FRG refused to grant recognition, the GDR government proclaimed a separate GDR citizenship and introduced a visa requirement for West Germans traveling to West Berlin and to the GDR. 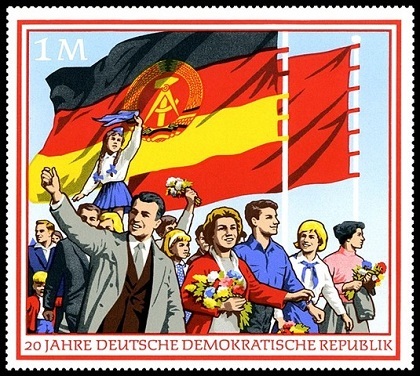 With these measures, the GDR began to practice a policy of new assertiveness and ideological delimitation (Abgrenzung) in response to the FRG’s policy of recognizing only one German citizenship. Membership in the UN was a primary foreign policy goal of the GDR in the late 1960s. A veto by the Western powers in the UN Security Council blocked the GDR’s bid, however. The GDR did gain admission to the International Olympic Committee, which permitted East German athletes to participate in the Olympic games as a separate team. For the GDR, however, the ultimate breakthrough in the area of foreign policy–a treaty with the FRG–came only after international political tensions began to ease under the new spirit of détente. In this new setting, there was no longer room for Walter Ulbricht, who had maintained a policy of confrontation with the West for many years. 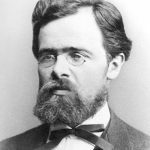 The Soviet Union, which had demonstrated considerably more flexibility than the GDR leadership during its negotiations with the FRG, was also irritated by the failure of Ulbricht’s economic program and by his attempts to demonstrate ideological independence by adhering to conservative Marxist principles. In 1971 the Soviet authorities ordered that Ulbricht be relieved of power. His replacement was Erich Honecker, who, as secretary of the Central Committee of the SED for security matters, had been directly responsible for the building of the Berlin Wall. Besides its increasing economic difficulties, by the end of the 1950s the GDR encountered another problem that began to threaten its existence: large numbers of people were leaving East Germany for the West. Nearly half of those who fled the GDR were under twenty-five years of age. Although crossing the border between the two German states had become dangerous after new security measures were introduced in the early 1950s and severe penalties for the crime of “flight from the republic” (Republikflucht) were introduced by GDR authorities in 1957, a relatively safe escape route remained via West Berlin, which could be reached from East Berlin using the city’s public transportation network. Once in West Berlin, refugees were registered and then transported to the FRG by air. Alarmed by the continuous population drain, the East German Politburo ordered the erection of a wall along the border between West Berlin and East Berlin. 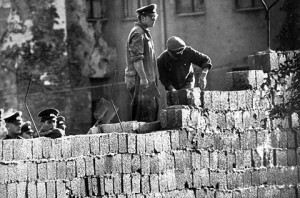 On Sunday morning, August 13, 1961, workers began building a three-meter-high concrete wall along the border of the Soviet sector of the city. Within a few hours, public transportation lines were cut, and West Berlin was sealed off from East Germany. Chancellor Adenauer and West Berlin’s governing mayor, Willy Brandt, sought to calm the outraged West Berliners. The Western Allies did not react with force because they were unwilling to endanger world peace. Up to that date, nearly 3.5 million had left the GDR for West Germany. After the building of the wall, the stream of refugees decreased to a mere trickle. The Soviet Union and seven of its European satellites sign a treaty establishing the Warsaw Pact, a mutual defense organization that put the Soviets in command of the armed forces of the member states. 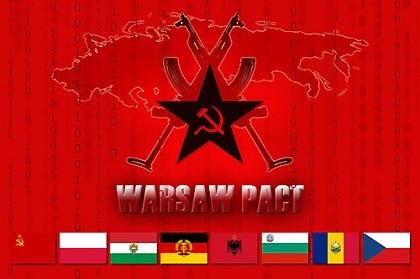 The Warsaw Pact, so named because the treaty was signed in Warsaw, included the Soviet Union, Albania, Poland, Romania, Hungary, East Germany, Czechoslovakia, and Bulgaria as members. The treaty called on the member states to come to the defense of any member attacked by an outside force and it set up a unified military command under Marshal Ivan S. Konev of the Soviet Union. The introduction to the treaty establishing the Warsaw Pact indicated the reason for its existence. This revolved around “Western Germany, which is being remilitarized, and her inclusion in the North Atlantic bloc, which increases the danger of a new war and creates a threat to the national security of peace-loving states.” This passage referred to the decision by the United States and the other members of the North Atlantic Treaty Organization (NATO) on May 9, 1955 to make West Germany a member of NATO and allow that nation to remilitarize. The Soviets obviously saw this as a direct threat and responded with the Warsaw Pact. The Warsaw Pact remained intact until 1991. Albania was expelled in 1962 because, believing that Russian leader Nikita Khrushchev was deviating too much from strict Marxist orthodoxy, the country turned to communist China for aid and trade. In 1990, East Germany left the Pact and reunited with West Germany; the reunified Germany then became a member of NATO. The rise of non-communist governments in other eastern bloc nations, such as Poland and Czechoslovakia, throughout 1990 and 1991 marked an effective end of the power of the Warsaw Pact. In March 1991, the military alliance component of the pact was dissolved and in July 1991, the last meeting of the political consultative body took place. 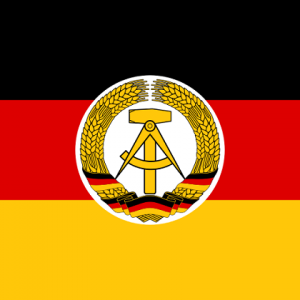 On March 1, 1956, the National People’s Army (Nationale Volksarmee–NVA) was officially created by transferring the existing paramilitary units of the People’s Police to the NVA. The new army was officially under the leadership of the SED and under the direction of the newly created Ministry for National Defense. Initially, the NVA was to be staffed by volunteers only, but in 1962, when recruitment presented increasing difficulties for the SED and its support organizations, conscription was introduced. 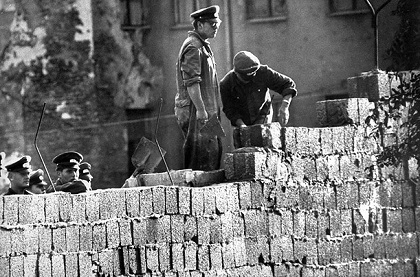 Before the construction of the Berlin Wall, conscription had been seen as impossible to enforce. In the GDR, as in the other new “people’s republics,” the authorities’ goal of abolishing private property and every trace of capitalism was to be implemented in several steps. By taking possession of all resources, as well as of the means of production and distribution, the socialist state hoped to be able to compete successfully with the capitalist West and finally demonstrate the superiority of the socialist system. Patterned on the Soviet model, the East German economy was transformed into a state-controlled, centrally planned production and distribution system by 1948. Beginning in 1945, large tracts of real estate and factories were taken over by the state under reform programs for agriculture and industry. After the foundation of the GDR, these reforms were pursued with vigor. In 1949 the new state became a member of the Council for Mutual Economic Assistance (Comecon), which included all other Soviet satellite states and had been created in order to coordinate economic planning in socialist states worldwide. The concept of multi year plans was introduced with the First Five-Year Plan of 1951. It was intended to make up war losses and also make possible reparations payments to the Soviet Union. For this purpose, heavy industry was built up on a large scale. 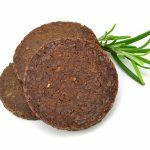 Production goals could not be reached, however, because of a chronic shortage of raw materials. The manufacture of consumer products was neglected completely. The Second Five-Year Plan, started in 1956, aimed to complete the nationalization of all industrial concerns and the collectivization of agricultural enterprises. 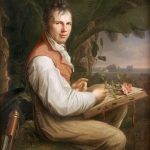 By the early 1960s, Kombinate (collective farms) accounted for about 90 percent of all farm production. Private farmers who resisted collectivization were arrested. When production began to decline in the early 1960s, the SED introduced the so-called New Economic System of decentralized planning, which delegated some production decisions previously the prerogative of the central planning authorities to the Association of Publicly Owned Enterprises (Vereinigung Volkseigener Betriebe–VVB). 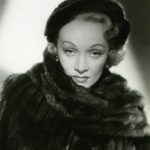 The VVB was to foster specialized production within individual branches of industry, including the previously neglected production of consumer goods. Production declined even further, however, and it became increasingly evident to many East Germans that their “planned economy” had lost the economic battle with the capitalist West. 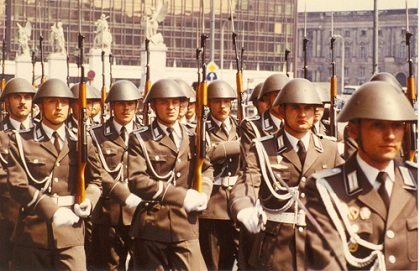 The most important instrument employed by East German authorities to guarantee their absolute rule was the State Security Service (Staatssicherheitsdienst, commonly referred to as the Stasi). Founded in early 1950 as the secret service branch of the Ministry for State Security (Ministerium fuer Staatssicherheit–MfS), the Stasi came to exercise almost complete control over the population of the GDR. 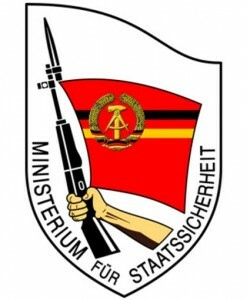 During the first five years of its existence, Stasi personnel were trained by Soviet instructors. In addition to its surveillance of the East German population–which was carried out with sinister thoroughness up until the final days of the GDR–the Stasi conducted extensive espionage activities in the West, particularly in the FRG. Aside from its approximately 100,000 full-time employees, the Stasi could also rely on the assistance of nearly 2 million civilian spies, or so-called informal employees (Informelle Mitarbeiter –IM), who reported regularly from domestic listening posts or from abroad. Experts agree that before its dissolution in 1990, the Stasi had developed the most perfect spying system ever devised to watch over its own citizens. It had truly realized the idea of the “glass-citizen,” whose every activity was known to and controlled by the state. In Stasi headquarters in East Berlin, detailed information on individual citizens was collected in huge archives, which survived, largely intact, the downfall of the East German state. An equally important role in building a permanent power base for the SED was played by mass organizations. One of the most important was the Free German Youth (Freie Deutsche Jugend–FDJ), founded in March 1946, in which young people between the ages of fourteen and twenty-five were to be indoctrinated as members of a new socialist society. Together with its suborganization for youngsters from six to fourteen years of age, the Young Pioneers–later called the Pioneer Organization “Ernst Thälmann,” in memory of the chief of the KPD during the Weimar Republic, who was killed in a concentration camp–the FDJ soon became an effective instrument for influencing the coming generations. An important part of its influence was that membership in the FDJ soon determined access to institutions of higher learning, recreation and sports facilities, and ultimately career opportunities. 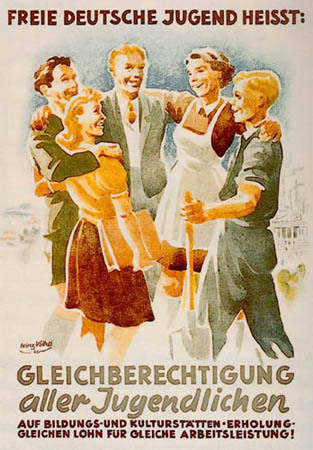 Another important mass organization was the Free German Trade Union Federation (Freier Deutscher Gewerkschaftsbund–FDGB), which attempted to motivate the workforce to achieve production goals and also provided members with opportunities for inexpensive vacations at FDGB-owned seashore resorts. Similarly, the interests of women were served by the Democratic Women’s Federation of Germany. By the end of 1947, all facets of society were organized in associations and groupings under the control of the SED. The GDR authorities also sought to deprive potential enemies within the state of the traditions and institutions upon which the state and society had been founded. A primary target for complete transformation was the court system. Judges and attorneys soon came to be used as mere instruments to carry out Marxist-Leninist goals. 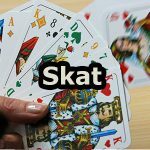 The legality of actions was determined by the political leadership. The SED also declared the traditional administrative division of East Germany into five Länder an obstacle to “efficient” governance. The five Länder, all grown out of long historical traditions, were abolished and fourteen administrative districts established. This measure gave the central government in East Berlin much greater control over the activities in these districts, which were now much smaller, and, equally important, allowed it to break with another aspect of Germany’s despised bourgeois history.